Twitter has a new queen. Britney Spears has pushed Ashton Kutcher out of his top spot on Twitter, successfully racking up more followers than even the "Twitter king" himself. At the time of writing, Kutcher (@aplusk) has some 4,941,340 followers to Britney's 4,950,344 (she tweets at @BritneySpears). 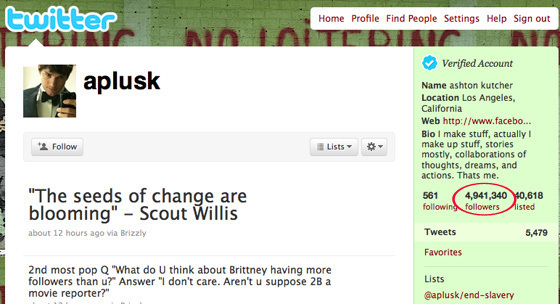 Spears surpassed Kutcher to become the most-followed Twitterer on the evening of May 23. The celebrities take different approaches to their Twitter presence. While Kutcher tweets himself (usually multiple times a day), Spears' Twitter account is handled almost entirely by members of her staff, like her manager, Adam Leber. 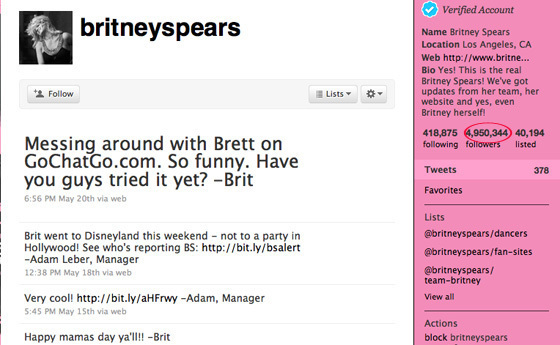 Spears tweets, on average, only several times each month, tagging posts she's written personally with "-Brit" or "-Britney." Twitter's other most-followed Tweeters are Ellen DeGeneres with some 4.6 million followers, Barack Obama with around 4 million followers, and Kim Kardashian with around 3.6 million followers.